Fall is my favorite season. The temperatures begin to cool off, pfizer holidays inch tantalizingly closer and new ingredients fill the stores. Winter squashes, viagra 40mg apples, gonorrhea pears, sweet potatoes. Comfort food. The best kind of food. This weekend it was storming out. Granted we’re in Miami so it was more like a Tropical Storm, but it just seemed like the perfect day for a casserole. So I made a big pot pie, but instead of using traditional carrots and celery, I sauteed the chicken with bacon, lots of portabello and crimini mushrooms and onions. Then I swapped the heavy bechamel for a smoked paprika-spiked butternut squash puree. 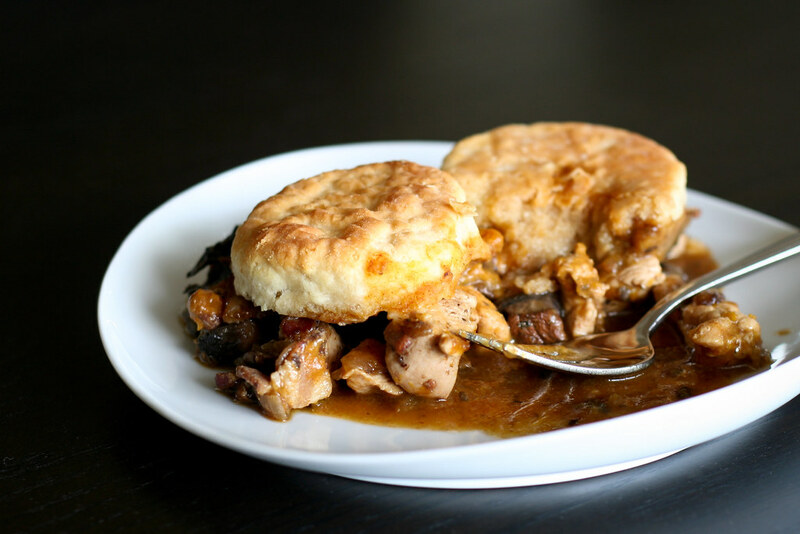 The mushrooms and the butternut squash melded into the most delicious gravy and the buttermilk biscuit top was just the thing to mop it all up. Not as heavy as your typical pot pie, but just as substantial and delicious. A new fall favorite around here! Preheat the oven to 350°. Place the butternut squash, milk, chicken broth and garlic in a small pot and set over medium-low heat. Simmer for about 20 minutes, or until the squash is tender. Remove from heat and blend with an immersion blender, blender or food processor until smooth. Stir in the smoked paprika and set aside. Grease a casserole dish (I used an oval one that holds about 4 quarts). Place the contents of the skillet in the baking dish, then ladle the butternut squash puree evenly over the top. Halve the biscuits and place them in an even layer over the top. Mmm, this looks like the perfect dish to cook on a cool fall day. Thanks for sharing! This looks amazing – I will make this for sure. Nice change from the traditional kind of Chicken Pot Pie and…. bacon… the best!! Love your images…What kind of lens do you use to get that narrow depth of field? This is a perfect recipe for the fall weather here in Montreal. I love the picture as well. Huge fan of pot pie, and this version looks amazing. Will add to my list of recipes to try! Wow. What an incredible pot pie recipe. I can just about taste the incredible flavors! What a great twist on a traditional chicken pot pie. Love the flavour combo of paprika-spiked butternut squash puree. Must have tasted great! I am unable to subscribe to your rss feed. I have tried twice now. I click the link and it takes me to a page that looks the exact same except after all of your posts a viagra ad is repeated 50 million times. Weird. Come Back! I know life gets in the way but I love your blog. I miss your blog, hope we’ll see you soon. I love fall as well, unfortunately we’re still having winter in Europe. Miss you, Mel. Hope all is well with Baby. I saw your photo and wanted to make this immediately! I’ve been looking for a tasty pot pie recipe and this one definitely looks like a keeper. I hadn’t thought of adding butternut squash, but I’m sure that it was an excellent addition. Thanks for the recipe!